It sure would. In fact, the kid could have simply stumbled upon the den and crawled in without the bear having wandered about outside. I know a guy who crawled into a bear den with a 10mm auto and killed one of the biggest black bear boars I've ever seen (7'3" squared). Absolutely huge. At the time he was a teenager. His dad was a co-worker, and certifiably nuts, so it must be genetic (although interacting with the guy today as an adult, you'd never know it). I can just imagine the explosion of that Delta Elite going off in that hole, never mind the monster in there with you. Gotta' be insane, but Native Alaskans do it all the time. I think female Bigfeet seek surrogate children. And after abducting one? They realize just how weak and frail a human child is. And attempt to give it back by leaving it close to human civilization. Or in some cases they might simply abandon the child or even eat it. Where's a "mind-speaker" when you need one? True. This mystery should easily be very cryptically explained. That's a very good point. I didn't consider that. The bear might not have ever known he was there. We're wandering far enough into la-la land without that, thanks you very much. Yeah, if Bigfoots exist they have to be close to human, so I can see that all being true. Yeah, I ain't climbing into a hole with a bear no matter what I'm carrying. I have not seen the account as related in The Locals, so I do not have any idea as to how much more info that account provides. The Russians use Laika dogs (Spitz style dog) to locate Brown bear dens. They cut a pole and push it down in the snow and probe for the Bear. When they wake the Bear up it digs out of the snow like some giant demon Badger into the fray of yapping dogs and men with guns. Yeah, but the dogs and being prepared with rifles would make it managable. I've never hunted with dogs. Horses and dogs would enable men to hunt to the maximun efficiency. I started following this guy. My first experiences in 2012 were with two possible bigfoots who were hanging out hunting (because a deer ran from the forest past me towards the lit dining hall and middle of camp) in fields right next to a children's camp. I was in the parking lot waiting for my kid and accidently interacted with them. When myself and a researcher went back to look around, we ended up trespassing into the edges of the camp along the river and found large paths leading to places where you could look into the camp but not be seen BY the folks in the camp. Very glad this little boy was found safe! His parents must have been so worried. Quite a story. Where can we read the full description of your encounter? This is my first post on this site. When I heard the boy was found, my first thought was aliens (I am a believer) or a bigfoot took care of him. But stuff like this borders on paranormal and how people go missing without a trace and then turn up relatively Ok and with no memories of what happened. I need to read more about this case before drawing any of my own conclusions. Could it be there is more than one species of bigfoot in the Americas? Could there be an intelligent form that abducts people or children and a less intelligent form that is shy and avoids people? Has anyone thought there is more than on e type, like black and brown bears are different? Some would have you believe there are 10 species of BF, even ones that are 1-2 ft tall. 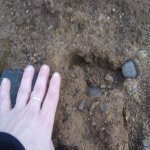 Natfoot, I'm not sure, but it might be in an old post "Searching For Bigfoot In Oregon". It's on here somewhere. Happened in August 2012, so I posted it after that when I first found this site. However, I think that references a different post. If you find it, let me know, too! I'll dig around, too.